Your coolroom always keeps your stored items safe and usable. And if they have been running efficiently for an extended period; you do tend to forget about its maintenance. That is until in the middle of a sweltering summer; it breaks down leaving you a nightmare on your hands. All your stored stock could get ruined, and your long-earned business reputation could be lost. To avoid such perilous situations, the smart thing would be to maintain your coolroom regularly, only to ensure it is always running optimally. Another perk to efficiently coolrooms is they reduce your monthly energy costs. Frequent Coolroom Maintenance is Paramount! The easiest way to stop the coolroom from breaking down is with frequent maintenance and possible repairs. It lets you know how the unit is functioning, and also pick out the potential issues before they turn into something serious and expensive. 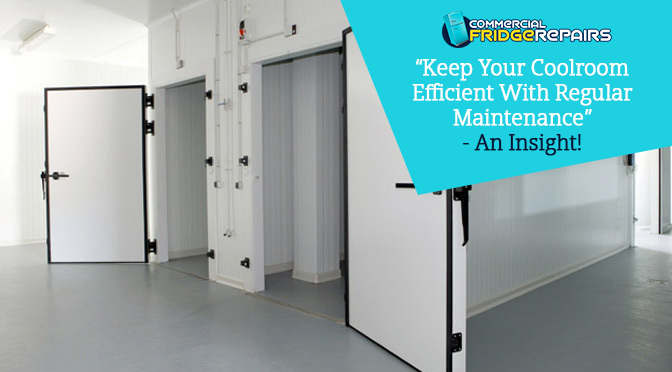 To perform the necessary maintenance and repair (if needed); you should contact our experts at “Commercial Fridge Repairs” to do it for you. Our professionals have the experience and are trained to handle the intricacies of coolroom and its functionality.  Ensuring the compressor is not leaking oil.  Checking if the PLC switchboard is working optimally.  Ensuring the cold room is cooling to its appropriate temperature.  Checking for ice formations on the evaporator and preventing it.  Inspecting every surface for unnecessary substances like moulds, leaking products, etc. 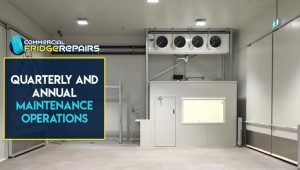 Our coolroom repairs and maintenance professionals operating in Sydney have all the latest tools and field experience to conduct each of these check-ups. If you wish for a monthly, quarterly and annually maintenance check-ups, our specialists will be happy to carry it out without hampering your lifestyle too much.  Ensuring the condenser coils of your coolroom are clean. This includes the evaporator and the condenser coil fins.  Checking all control valves.  Checking if the reverse blowing is working properly or not.  Inspecting the defrost system and checking if it is working as well as it should.  Examining whether the evaporators are working effectively.  Cleaning the blower fans.  Performing a system functional test to ensure it is devoid of any issues. Our licensed and experienced coolroom maintenance experts inSydney will also offer you budget-friendly quarterly and annual maintenance packages.  Performing all necessary maintenance operations (given above). They will also inspect the efficiency of the room.  If the need arises, our professionals will also wash the heat exchanger using the right chemicals. This is to remove any impurities which may hinder the operation of your coolroom.  They will also focus the coolroom door only to make certain that the cold air stays inside the room. Their comprehensive check-ups will include components like – IR reflectors, rollers, brackets, emitters, control boxes, alignment of the door, the door sensor and hinges. Professional maintenance and care can add a few more years to your coldroom. It is something that you should not look to avoid. 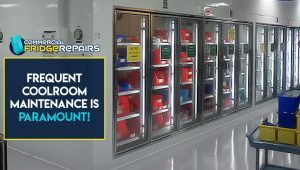 Speak to our experts at “Commercial Fridge Repair” about your maintenance needs. They will provide same day maintenance and replace the broken parts with genuine oneshaving a 1-year warranty. Quality service will be guaranteed. So, without delay, call them immediately!